We gather for deep worship at 11 AM, with song, prayer, stillness, and Louise Neal bringing her message, “Love Your Enemies,” based on Matthew 5:38-48. And our special presentation on Shared Security at 1 PM. The speaker will be Stephen McNeil of the American Friends Service Committee, who will tell us about this Quaker vision for US foreign policy jointly developed by AFSC and the Friends Committee on National Legislation. 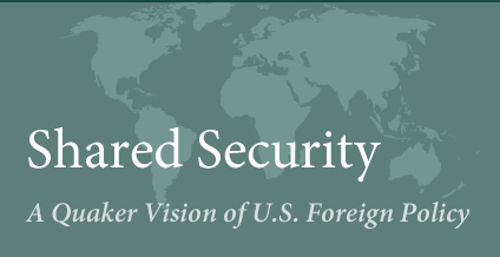 The goal of Shared Security is to prevent war and to advance global security for all, in contrast to the zero-sum approach that our government and others so often take. Stephen will present the history of Shared Security, the ways it has impacted countries like Kenya and Iran, and altered US State Department policies. See the attached flyer for more.